Santa Claus is Coming to Town, Seattle Style! 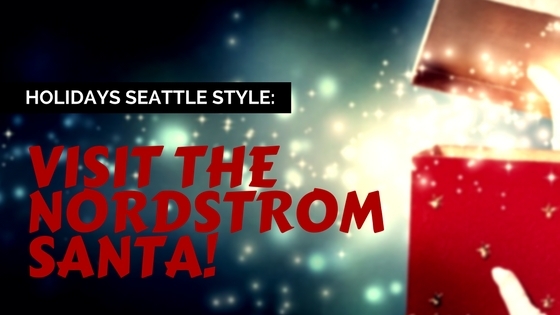 The Nordstrom’s Santa is a long-standing Seattle tradition and should not be missed if you are here during the holiday season. The famed Santa first came to Seattle in December of 1943 and set up shop in Seattle’s beloved department store, Frederick and Nelson. Frederick and Nelson closed its doors many years ago, but Nordstrom’s (now in its place downtown) has kept the tradition alive. When you arrive to Santa’s Lane, you are met by a Nordstrom’s “Elf” who offers you hot apple cider and your choice of a snicker doodle or chocolate chip cookie while you wait for your turn. When you are second in line, you are taken up to where Mrs. Claus is waiting with a candy cane and greets your child(ren) by name, immediately putting them at ease. When it is time to meet Santa, you have the option of sitting on Santa’s lap, or for some timid kids, they have a cute rocking horse next to Santa that they can sit on. While professional pictures are taken (packages starting around $25), they encourage you to take your own pictures with your cell phone or camera. Then Santa takes a few moments with each child to ask them what they would like. The experience is always magical. Santa Lane, located on the corner of 6th and Pine, across the street from Pacific Place Mall, opens just after Thanksgiving weekend and runs until Christmas Eve. For hours of operation, please check the store’s website at http://shop.nordstrom.com/st/nordstrom-downtown-seattle. •	Go as early in the holiday season as possible. The closer it gets to Christmas, the longer the lines become. •	Go first thing in the morning on a weekday, rather than a weekend. •	Arrive at least half an hour before Santa Lane opens, there will already be a line forming by the front door. There is a Starbucks right across the street, so one adult can wait in line, while the another takes kids over for a hot chocolate. •	If the line is hours long, give them your phone number and they will send you a text when it is time to come back. That way you can go have a delicious breakfast or lunch at the Nordstom’s Café while you wait.